Week 4 started a two-week focus on Breads. I can’t believe 4 weeks have passed already. It’s all been a delicious blur. I wasn’t very good at keeping blog notes each day this week – usually I’ll write a quick draft of each day in the evening when I get home. That didn’t happen this week since we had a test I needed to study for. As such, this post will be less detailed than most, which may be a relief to my readers :). 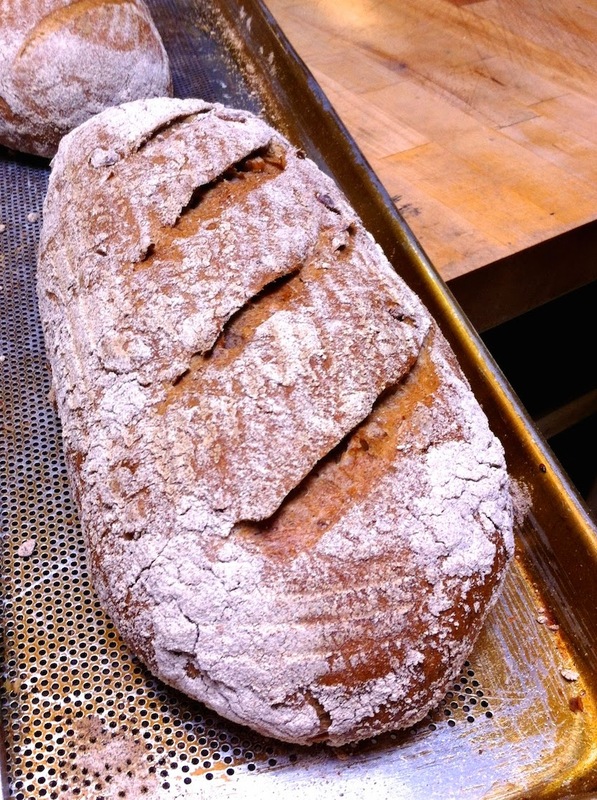 I first heard about preferments this summer, when my aunt was telling me about the sourdough bread she makes. She mentioned a “starter” that she “feeds” and leaves in her fridge. This was so foreign to me and the thought of letting something ferment intentionally kinda grossed me out – not gonna lie. The short of it is that preferments make your bread taste better. 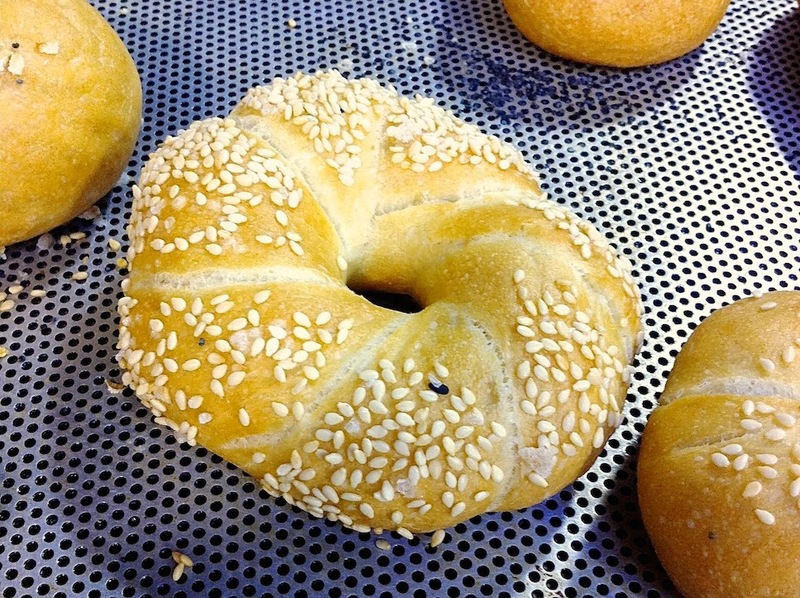 The longer the yeast is active, the better the flavor and texture you’ll get. 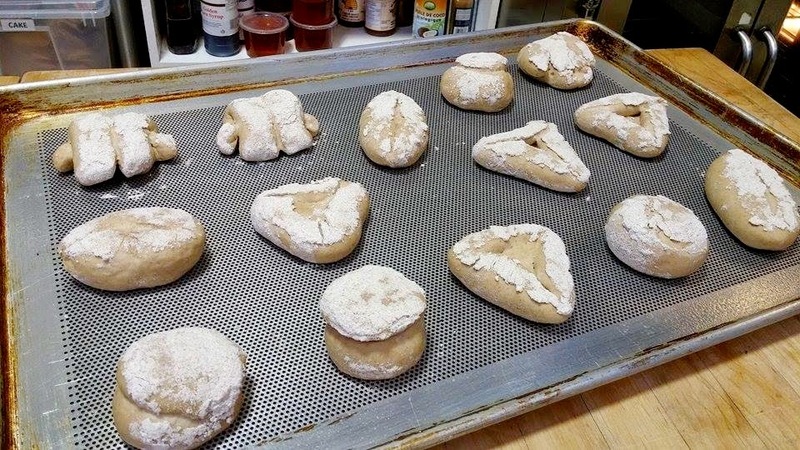 To do this, you create a small portion of the dough (typically includes flour, water, and yeast) and allow it to ferment overnight. 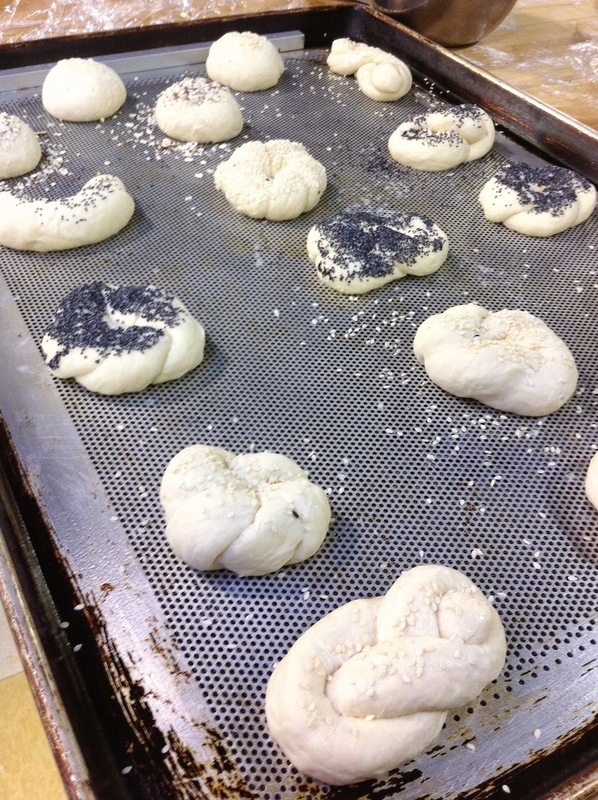 There are a variety of different preferments, and they go by different names (Poolish, Biga, Starter, etc). 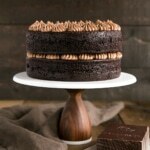 So, in addition to everything we baked during the day, we also needed to create preferments for the next day. As such, I’ve added a preferments category to the bottom of each day so you can see what we did in advance. I love making the shapes for these! They turn out so pretty (most of the time). 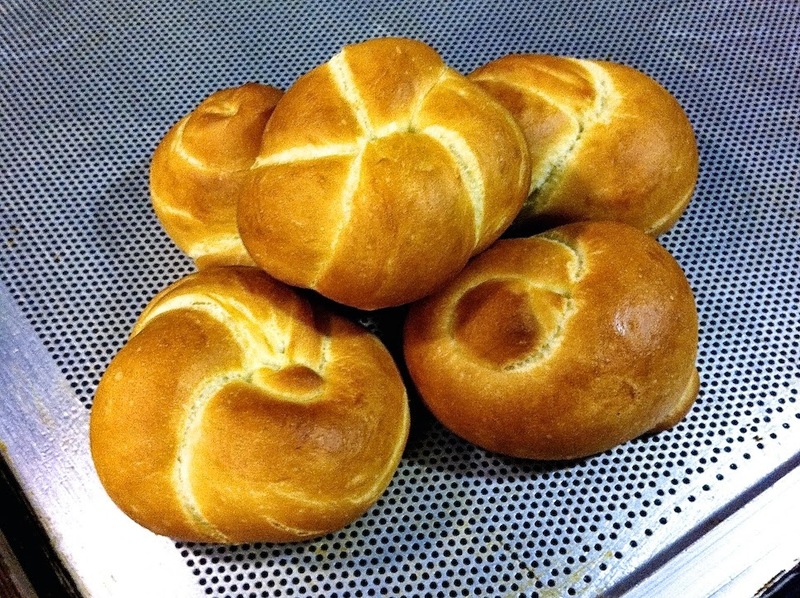 And a basic lean bread dough. My partner and I added too much flour to ours, so the dough was really dry and dense. We were able to save it a bit, and it still tasted good, but could have been better. It looked pretty though! 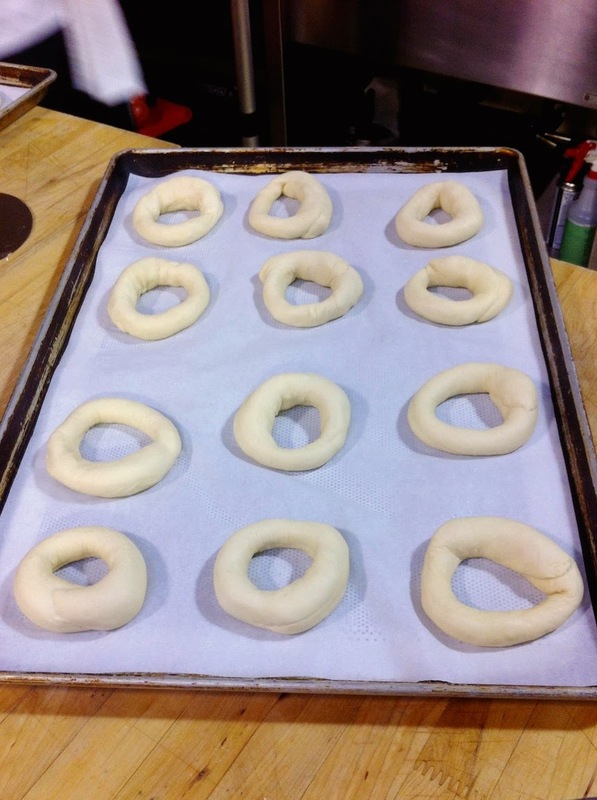 We also started our bagels today. 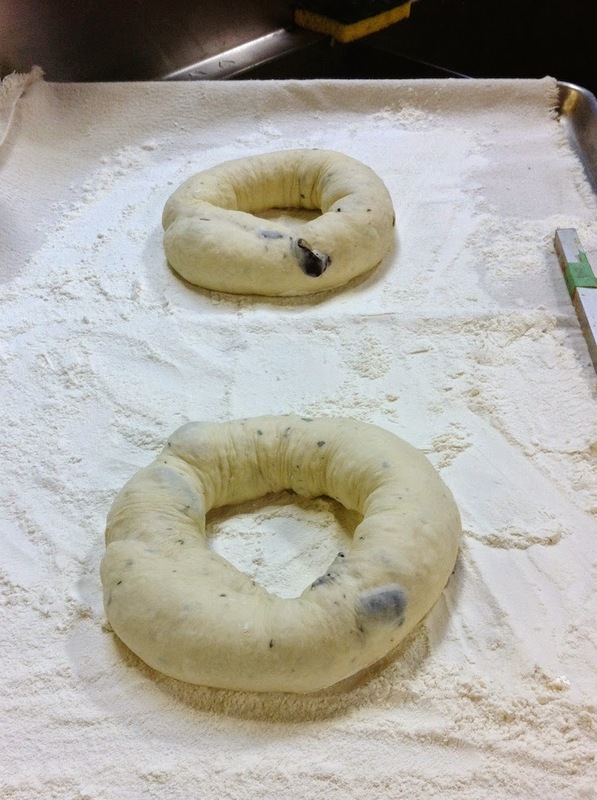 We made the dough, shaped them, and let them proof overnight to be baked tomorrow. The evening was spent studying for our first quiz on Wednesday. This was an exciting day. 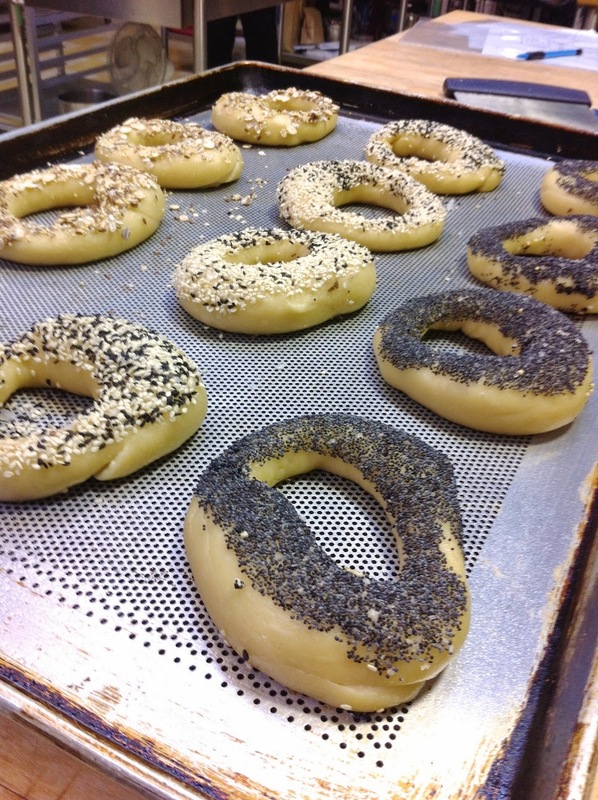 I think everyone was eagerly anticipating the bagels, and they did not disappoint! Here’s a pic from the day before, when my partner and I shaped them. Need to work on this a bit, as some were kinda wonky. 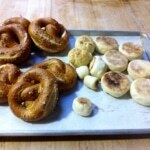 …and immediately dipping them into some seeds. 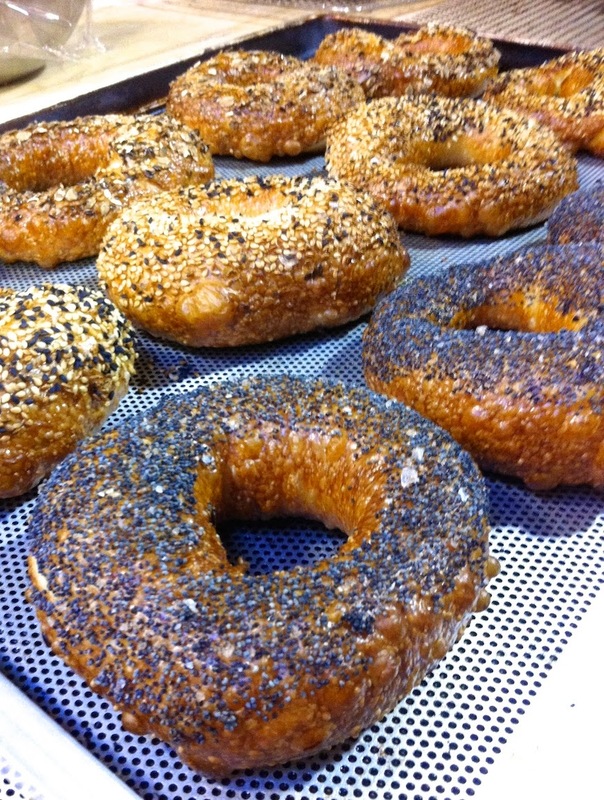 We did mixed oats, black & white sesame (my fave), and poppyseed. Chef Warren whipped up some cream cheese and sliced up some lox for us, so we had a pretty amazing lunch this day! 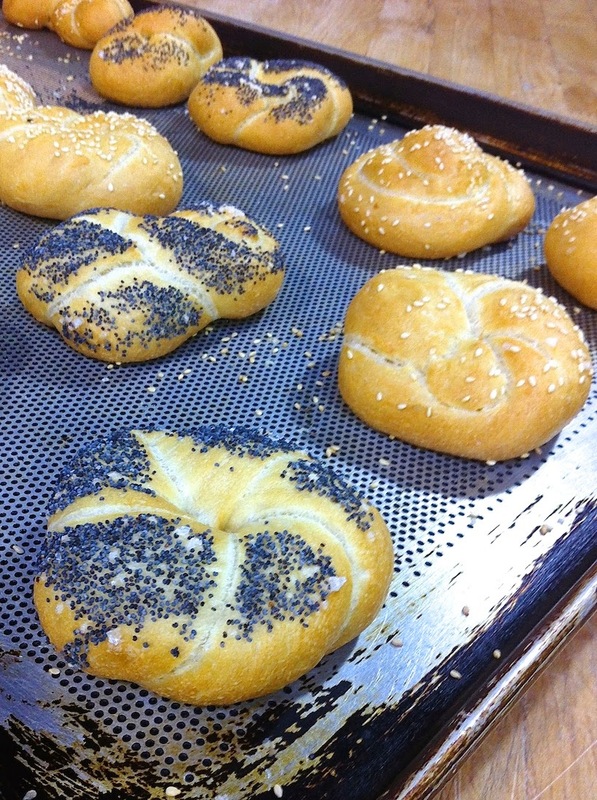 Next up were hard rolls using some of the same shapes we learned the day before for the soft rolls, and some new ones. I love these rolls! They taste so good. Still have a couple in the freezer. Yum. My favorite shape is the kaiser. So pretty!! 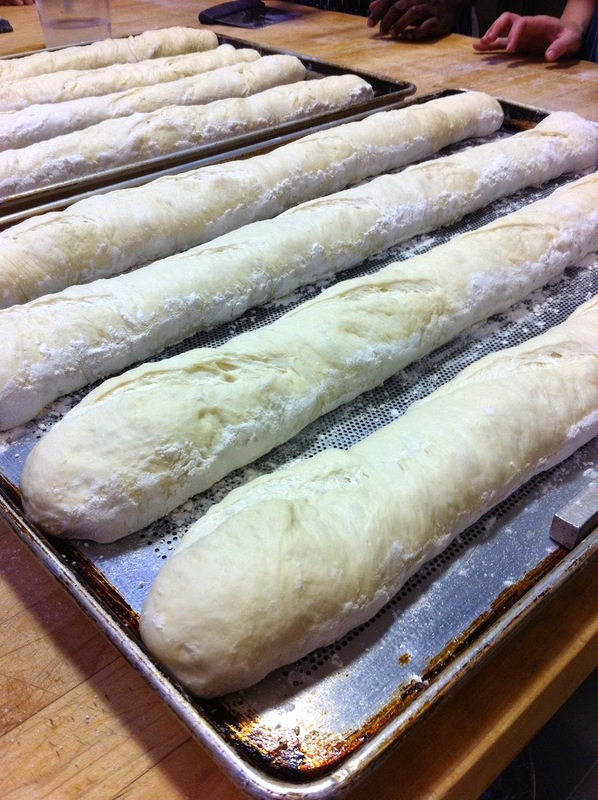 This was also Day 1 of baguettes. 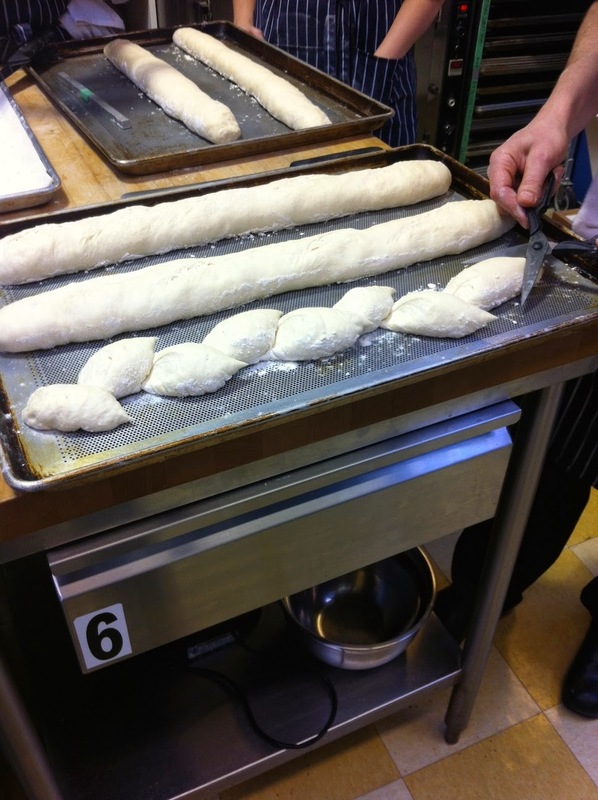 We’ll be making a baguette every day of the Bread Weeks, as it will be on our midterm and we need the practice. These were way more complicated than I thought they’d be. 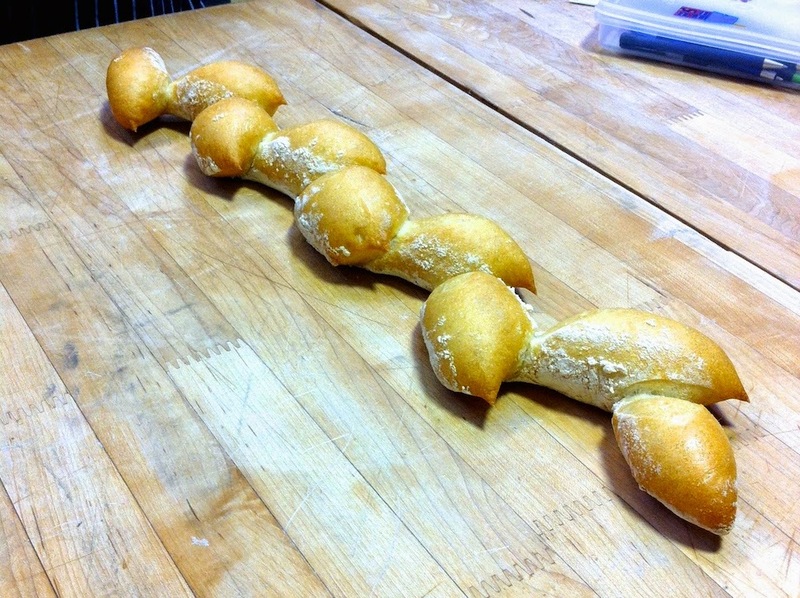 I literally thought you’d just whip up a dough and roll out a long piece and form it into a baguette shape. Instead it’s a complicated multi-step process, and the shaping has been a challenge for me. I can’t seem to get the baton looking quite right. Either the baguette is too long or the form is not tight enough. The process is hard to explain, so I won’t go into the details. …. then onto a perforated pan to go into the oven. I can’t remember which one is mine!! Possibly the 3rd from the bottom. I think mine’s the 2nd one from the left here. I remember it having a huge knob at the end. 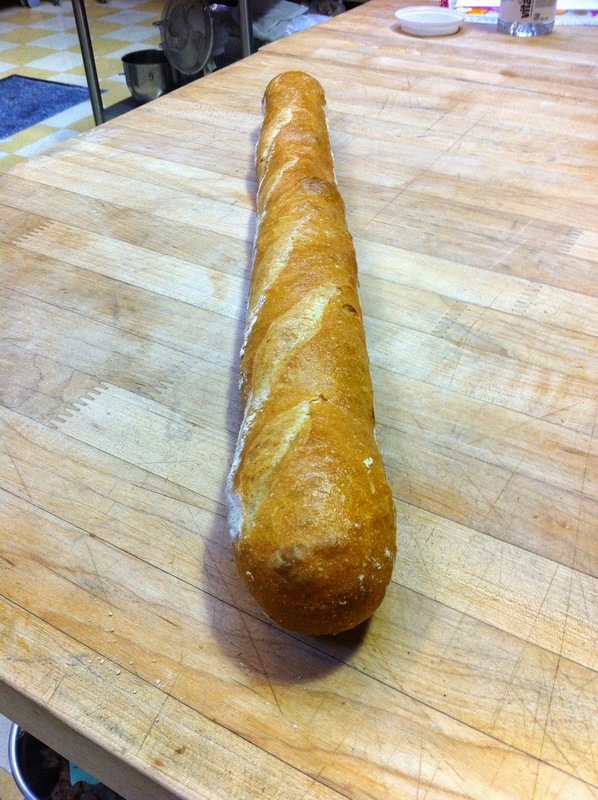 Chef Warren gave us a hard time about the length of our baguettes. 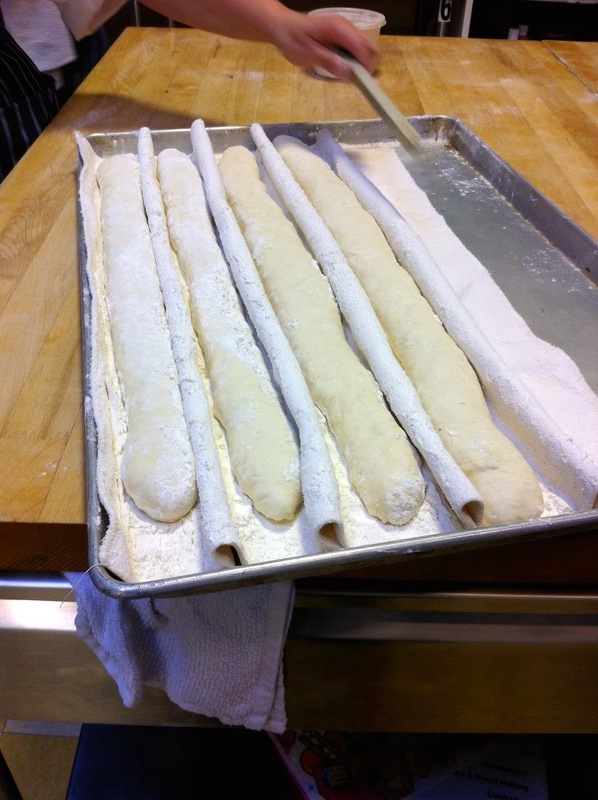 You have to transfer the batons twice and each time you do, it stretches the baguette. In the final transfer he kept telling us we would have “wrinkly bottoms” because we had to smush them into the pans a bit. It was actually quite funny. 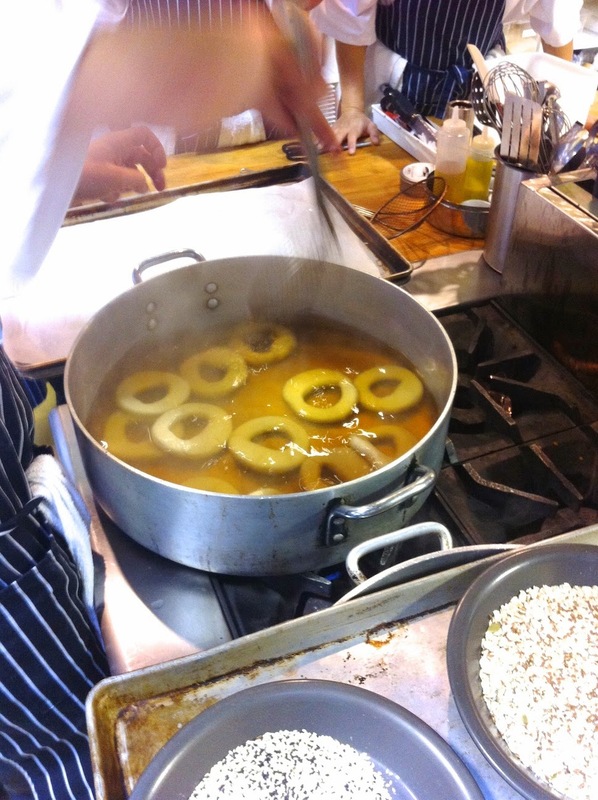 Chef Warren also did a couple of demos for us today. 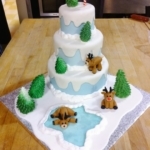 One was the Epi (shown below) which I LOVE and had no idea how it was made. You basically take your shaped baguette and cut sections with scissors then use the scissors to move each section left and right. I love the way these look! 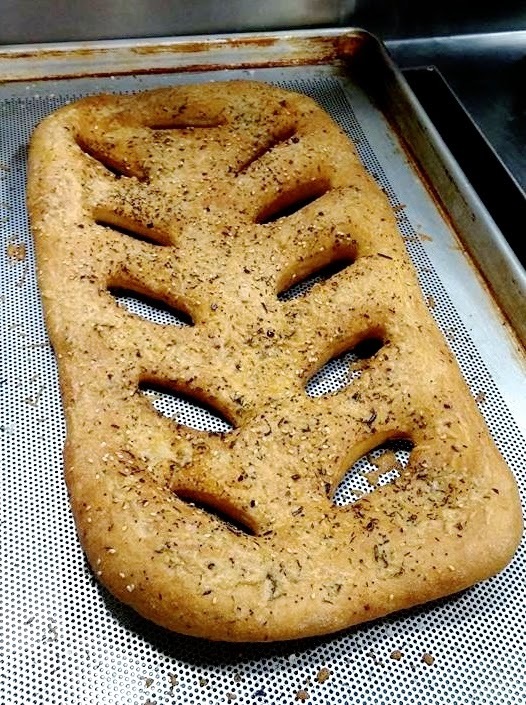 Chef Warren also demo’d a Fougasse (photo by Sophia). 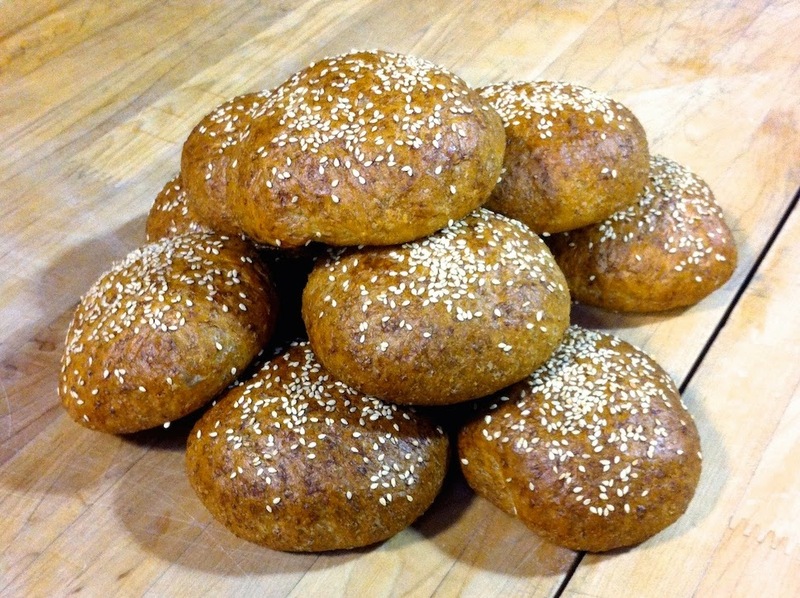 We also made Rye Beer rolls today which I apparently also forgot to take a pic of. It’s too bad because we learned a few different shapes for them. I SWEAR I took a few pics, but none are on my phone :(. Fail. *edit* Sophia sent me a pic of hers. These are pre-baking (I think), though they generally looked the same afterwards. More studying tonight, which basically entailed Ryan quizzing me for an hour from my notes and weekly reviews… ♥ him. Another exciting day in the bread world. We had Chef Warren again today and, as I mentioned last week, the days with him can be a little intense – but I think I’m getting used to it. Today was a really good day! I don’t think I’ll ever meet someone more passionate about bread and bread making. He really knows his stuff and loves teaching others about it, which is great to see. I’m happy to report that I was not completely exhausted at the end of the day. 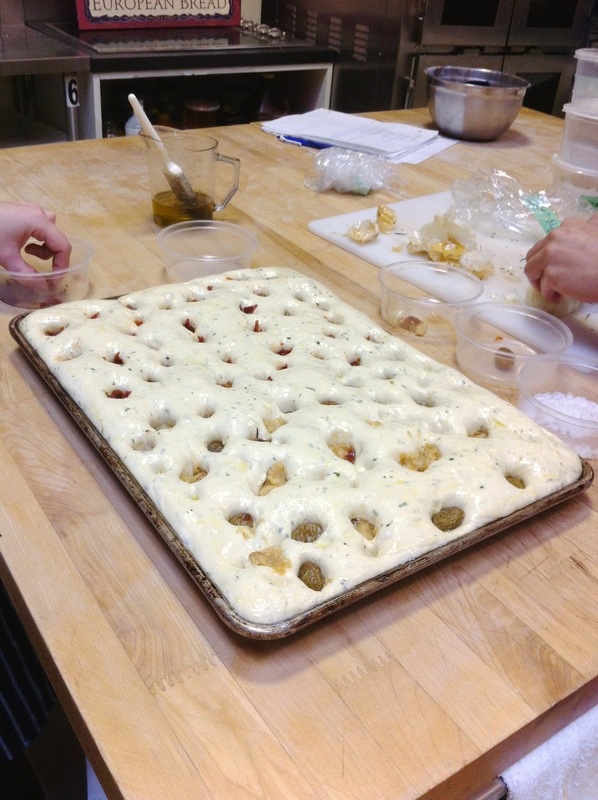 The highlight of today was the Focaccia. 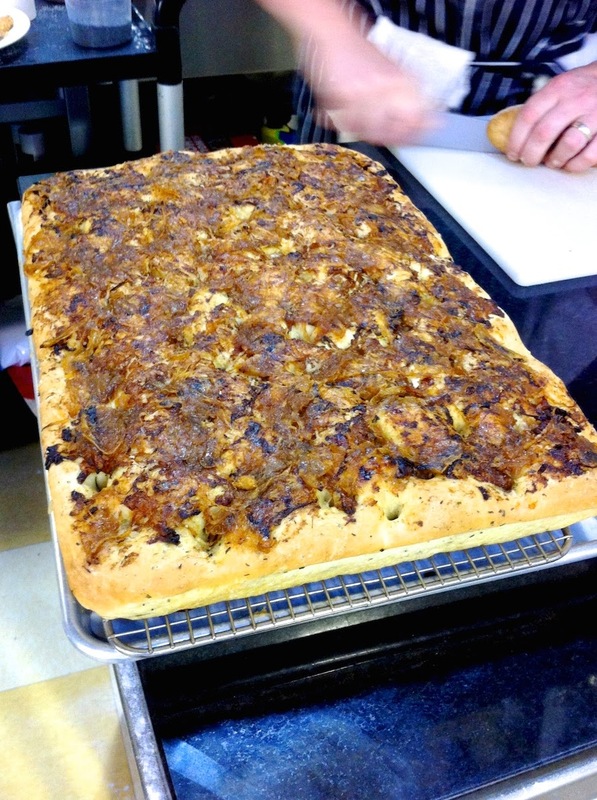 The above pic is of Lindsay and Sophia’s prefect looking focaccia. We stuffed these with olives, roasted garlic, dehydrated grapes, various herbs, salt, and (of course) slathered it with a ton of olive oil. 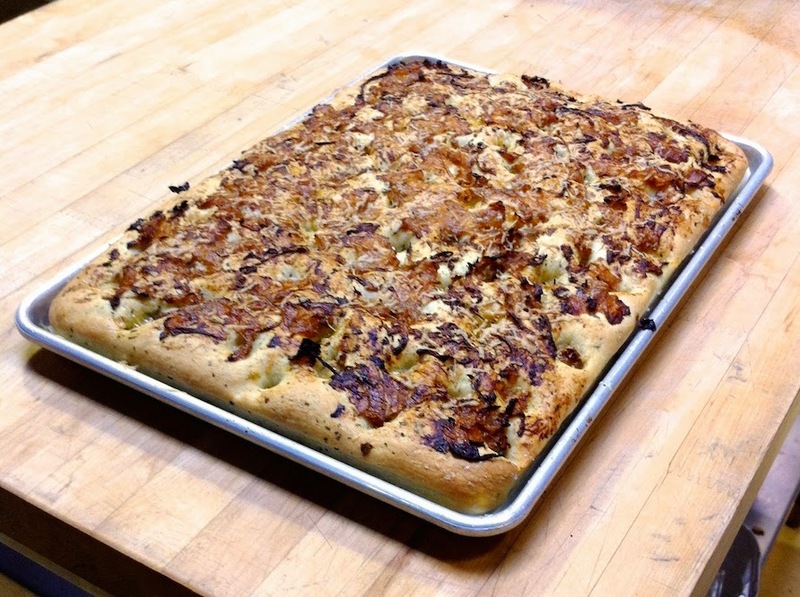 Ours was also topped with caramelized onions, which are pretty much the best thing ever. We also made Sourdough today. German Rye. One with and one without walnuts. I prefer without. 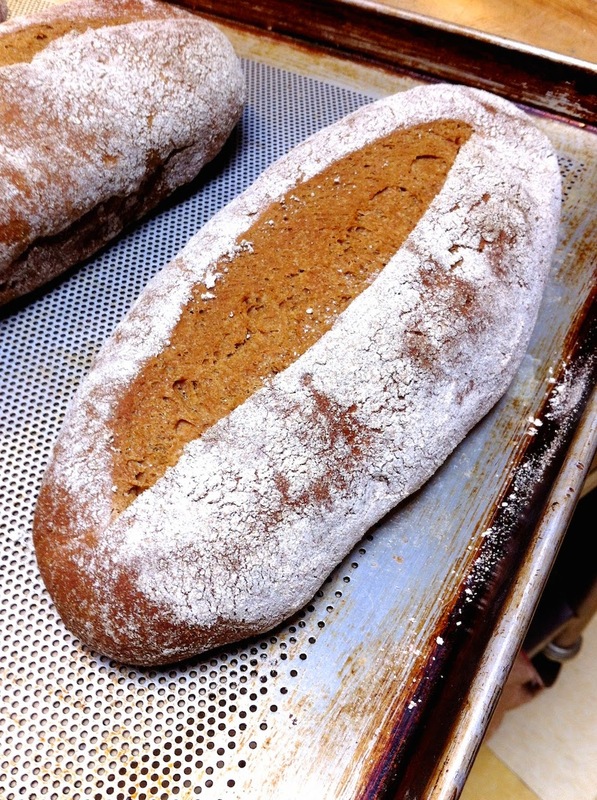 And Scandinavian Rye, which uses molasses. A good fall bread I think! 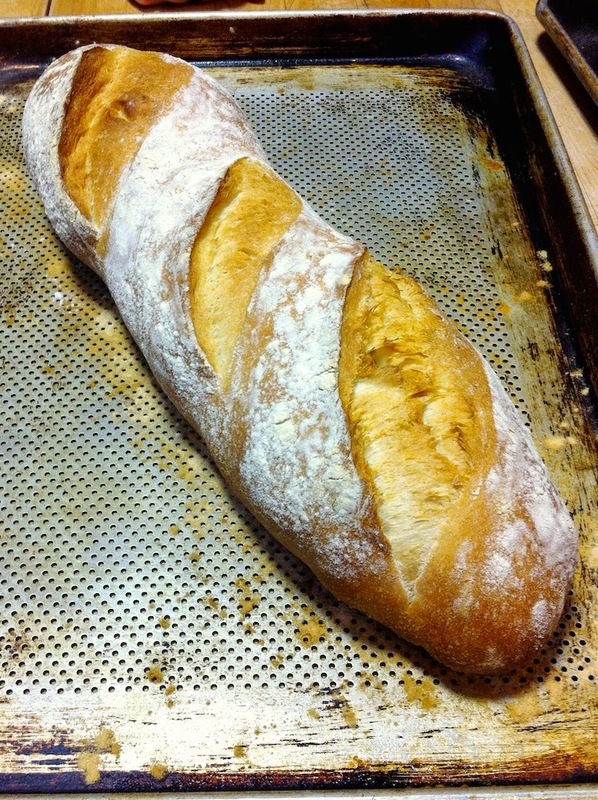 We made another baguette, but I didn’t take any pics – you get the idea. In hindsight I should have, so I could see my progress. I vaguely recall it turning out not-so-well and me taking my friend Laura’s home instead. We also had our quiz today. It was way more intense than I expected it to be… we had to write out not one but TWO recipes, not to mention conversions, flour percentages, etc. It actually took me a good 45mins to finish. 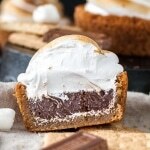 There were some questions I wasn’t sure about and I screwed up some elements of one of the recipes. I was hoping to get over 80% but I really wasn’t sure. The bread is super soft inside! I actually haven’t tried it yet, but we have a few slices in the freezer. 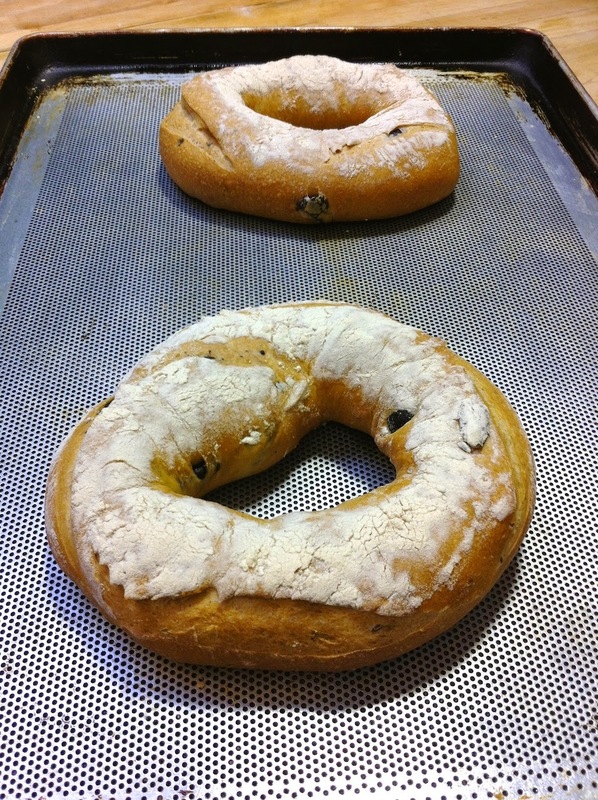 We also made a Country Bread stuffed with olives. I’m not a fan of olives, but I brought some home for Ryan and he loved it. I did happen to take pics of my baguette today, as it turned out almost perfect, but it didn’t start out that way…. Because my baguettes have been too long, today I overcompensated and made a very tight baguette that ended up being way too short when set for proofing. It was about 3 inches off everyone else’s. Thankfully, after moving it to the couche and then to the pan, it stretched out a bit and ended up being the best one I’ve made so far! I have trouble with the slashing. It’s harder than it looks, so I need to work on that. Also, the dough was overworked a bit, and the baguette wasn’t as soft inside as it should have been. 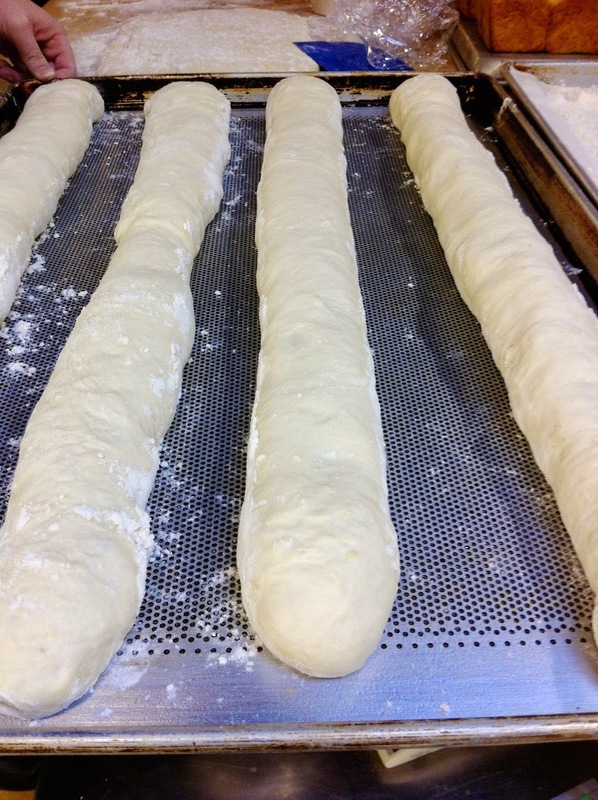 Again, it’s a tricky process to get right, so understandable that we’re doing it every day in hopes of finally making the perfect baguette. Hopefully that happens for the midterm! 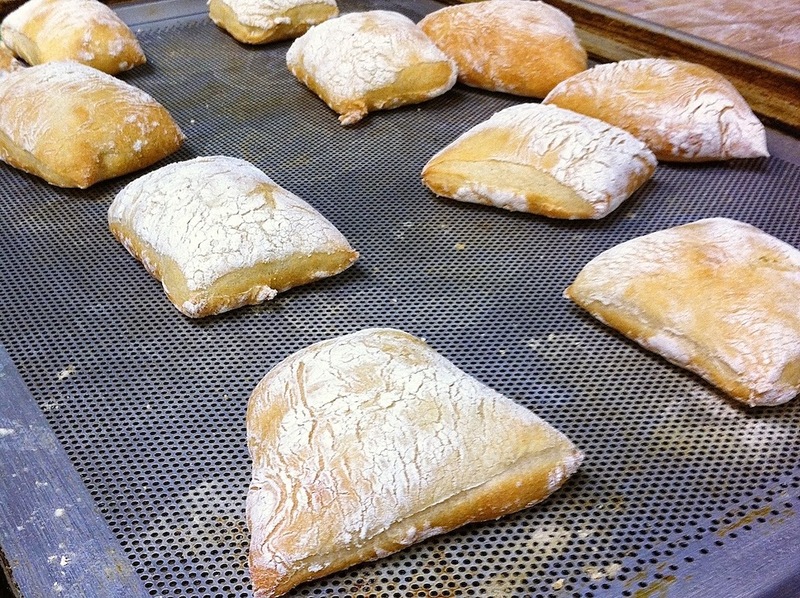 We also made ciabatta buns today, which was incredibly exciting! Love ciabatta! Perfectly puffy pillows. The above is a pic of Laura’s ciabatta, as ours turned out a bit flat and didn’t have quite the pretty flour dusting hers did. We started the day making pumpernickel, which I don’t have a picture of yet as it takes HOURS to bake. I think it was probably going to be about 7 hours or so. Then once it’s baked, you let it sit for an entire day before cutting into it. So, pics of that next week. We also made a Whole Wheat Mash bread that uses soaked, mushy whole wheat bread as a starter (gross, right?). It makes the bread incredibly moist though! Looks very similar to the Whole Wheat Toast bread we made earlier this week. 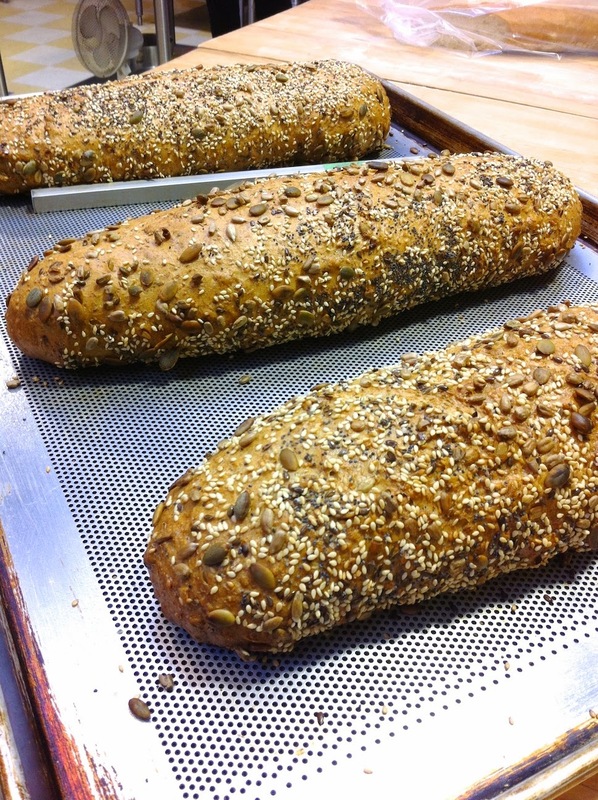 We also made Multigrain and Seed bread which has about a million seeds in it. Seriously. You can only see the outside, which we rolled around in more seeds, but I can’t even believe how many seeds we had to knead into this sucker! 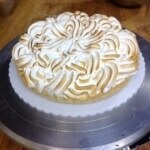 It was too warm to cut into at the end of the day, so we’re saving this one for Monday. Hopefully I remember to take a pic of the inside! We also made another baguette and got our test results back. I did way better than expected and totally aced the test! So happy about that, and relieved. I learned a LOT about breads this week. I literally thought it was just throwing some flour, yeast, and water together and baking, but it’s so much more complicated than that. I can appreciate the effort that goes into it, but I don’t love making bread. 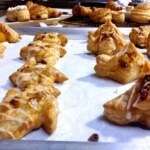 I love to eat it, but making it is a messy process, and I don’t love sticky dough all over my hands. 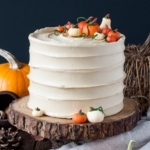 That being said, it has been a nice change from all the sweet things we’ve been making, and I might actually make some of these recipes at home! 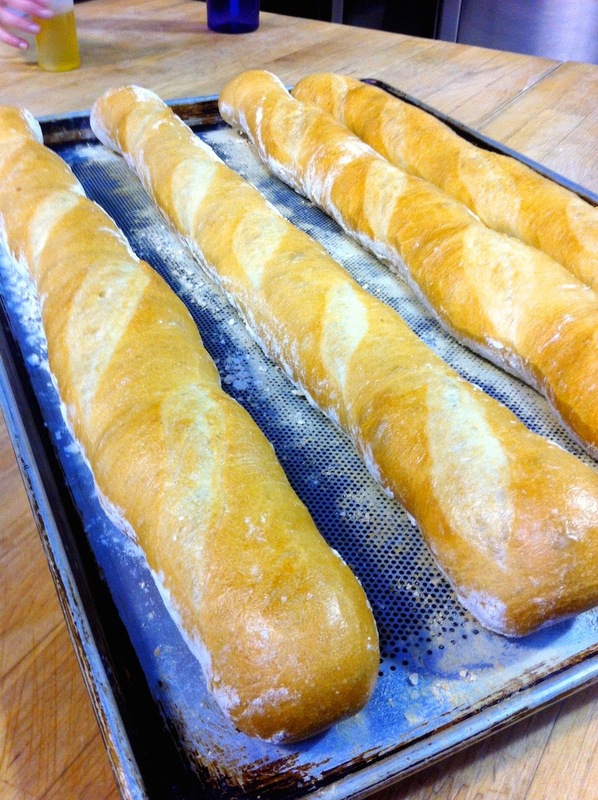 The baguette is delicious, homemade ciabatta, focaccia… Yum. It’s been a month of school now, and I’ll admit I still have good and bad days. Tuesday was one of those, “why exactly am I doing this again?” days, but I bounced back on Wednesday and was feeling good about things. I imagine that will be an ongoing process depending on the day/week. I’m already dreading midterms… not so much the written tests, but the practical work. I don’t do well under pressure, and can make stupid mistakes. Blah. We have another week of breads coming up, which is good as I still need to work on my shaping. 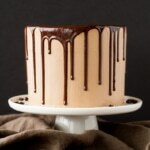 We go back to sweet things at the end of next week, including cakes, which I am just a little excited about! !